UCLA researchers have discovered that a combination of drugs, electrical stimulation and regular exercise can enable paralyzed rats to walk and even run again while supporting their full weight on a treadmill. Published Nov. 20 in the online edition of Nature Neuroscience, the findings suggest that the regeneration of severed nerve fibers is not required for paraplegic rats to learn to walk again. The finding may hold implications for human rehabilitation after spinal cord injuries. "The spinal cord contains nerve circuits that can generate rhythmic activity without input from the brain to drive the hind leg muscles in a way that resembles walking called 'stepping,'" explained principal investigator Reggie Edgerton, a professor of neurobiology and physiological sciences at the David Geffen School of Medicine at UCLA. "Previous studies have tried to tap into this circuitry to help victims of spinal cord injury," he added. "While other researchers have elicited similar leg movements in people with complete spinal injuries, they have not achieved full weight-bearing and sustained stepping as we have in our study." 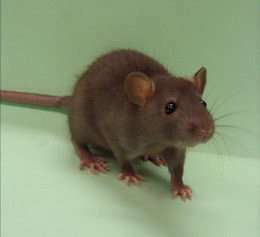 Edgerton's team tested rats with complete spinal injuries that left no voluntary movement in their hind legs. After setting the paralyzed rats on a moving treadmill belt, the scientists administered drugs that act on the neurotransmitter serotonin and applied low levels of electrical currents to the spinal cord below the point of injury. The combination of stimulation and sensation derived from the rats' limbs moving on a treadmill belt triggered the spinal rhythm-generating circuitry and prompted walking motion in the rats' paralyzed hind legs. Daily treadmill training over several weeks eventually enabled the rats to regain full weight-bearing walking, including backwards, sideways and at running speed. However, the injury still interrupted the brain's connection to the spinal cord-based rhythmic walking circuitry, leaving the rats unable to walk of their own accord. Neuro-prosthetic devices may bridge human spinal cord injuries to some extent, however, so activating the spinal cord rhythmic circuitry as the UCLA team did may help in rehabilitation after spinal cord injuries. ocilloscope would show frequency in microvolts"
Frequency in microvolts??! Perhaps you were trying to indicate A FREQUENCY that abides in the microvolt range..? Please clarify. Further, ""Inductance/capacitance circuits" were you drawing an analog to a particular cellular/neurological structure that ACTS AS A Tank circuit? Can you please clarify? To which brain patterns were you specifically referring? You seem familiar with some other work in "Nerve-to-chemical-Electronics" can you provide a link and some background data of your own? Remember the old Frankenstein movies? You know, with Boris Karloff and his crew. Perhaps, they were not so far off after all! Whats the best possible end result of this research? I'm picturing a console game controller being used to "drive" the legs of the person in the proper direction, speed, cadence, etc. Very liberating, especially since the only alternative is "sit here until someone physically lifts you to somewhere else".